InstantAction CEO Louis Castle says videogame retailers are "parasites" who have "abused the industry horribly" with videogame rentals and used game sales. The battle between videogame publishers and retailers usually looks more like a rivalry between brothers than a genuine fight. They might play a little rough now and then, but the publishers keep putting games in boxes and the retailers keep selling them and at the end of the day, everyone goes home more or less happy. 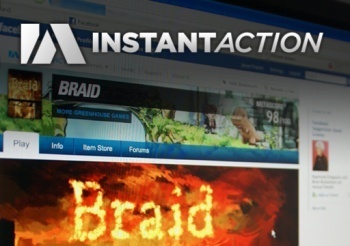 But Castle, the co-founder of famed development studio Westwood who left EA in 2009 to become CEO of the browser-based game company InstantAction, seems to be taking the issue a little more seriously, accusing the retail sector of bleeding the industry dry and saying that he hopes InstantAction helps kill brick-and-mortar outlets once and for all. "I have no love at all for the Wal-Marts and GameStops of the world," he said in an interview with GamesIndustry. "They've abused the industry horribly with selling used games and rentals." "There's no love lost there at all. They're all desperately trying to figure out where to go next too, but at the end of the day they've killed the distribution method," he continued. "They've put our entire industry in jeopardy by taking all of the money out of the system - between them and the pirates it's really a tough way to go." He refused to predict when we might see the end of physical game sales, saying that conventional retailers "are going to be around for a long time," but added that every new technology puts it one step closer to the grave. "We're not going to be the only technology out there, but every one of them will be another brick in the wall, another step in the right direction to saving our industry from partners that became parasites," he said. "They're really no longer partners - they're killing the goose that lays the golden egg."